The fungal genus Fusarium causes several diseases on plants known as cucurbits, which belong to the family Cucurbitaceae. Some species of Fusaria are responsible for vascular wilts, such as the crop-specific disease Fusarium wilt of melon (cantaloupe and muskmelon) caused by Fusarium oxysporum f. sp. melonis. Another Fusarium species, Fusarium solani f. sp. cucurbitae, causes a crown and foot rot of summer squash and pumpkin, and a fruit rot of pumpkin. Still other Fusarium species are responsible for preharvest and postharvest fruit rots of assorted cucurbits. Although the species of the genus Fusarium have many characteristics in common, the three diseases mentioned will be discussed separately. Fusarium wilt of melon (Fusarium oxysporum f. sp. melonis abbreviated as Fom) was first reported as a disease of melon in the United States in New York in 1930, although pathogenicity was not confirmed until the disease was described in Minnesota in 1933. By 1945, the disease was described from states as far west as California and north into Ontario, Canada. Although the pathogen is not uniformly distributed throughout the melon-producing regions of the world, it is very widespread. Until recently, the only described race of Fom in the United States was race 2. In 1985, race 1 was reported from Maryland, and in 1987, race 0 was discovered in Texas. In 1992, race 1 was recovered from collapsed melon fields in New York (fig. 1). But race 2 still remains the most widely distributed race in the United States. In contrast, race 1 is the most common race in Europe and the Middle East. Until recently, race 1,2 had only been reported from France, but is now known to occur in Maryland. Through the early breeding efforts of Henry Munger, two Fusarium-resistant varieties (with Fom-2 resistance gene) were released to meet the early needs of New York growers: Iroquois in 1944 and Delicious 51 in 1951. Fusarium wilt of melon is caused by a seed- and soilborne fungus that is specific to melon. Separate pathogens or formae speciales (f. sp.) are responsible for Fusarium wilts of watermelon and cucumber and are not discussed here. Investigations over the years on pathogen variability (called races) have led to the description of as many as ten races. Most researchers, however, now accept the race determination scheme based on specific resistance genes found in melon differentials that the pathogen overcomes. The four races described for Fom are called races 0, 1, 2, and 1,2. Currently, races 1 and 2 occur in New York. Although plants may be affected in any stage of development, the most common expression in New York is on mature plants. On young seedlings, a hypocotyl rot and damping-off may occur. In older plants, there is marginal yellowing progressing to a general yellowing of the older leaves, and wilting of one or more runners. In some cases, sudden collapse occurs without any yellowing of the foliage. On stems near the crown of the plant, a linear, necrotic lesion may develop, extending up the plant and usually on one side of the vine (fig. 2). One runner on a plant may wilt and collapse, with the rest of the runners remaining healthy. A gummy, red exudate may ooze from these lesions, but this may also be caused by gummy stem blight and insect injury. Vascular discoloration should be evident and is very diagnostic (fig. 3). Mature plants often wilt severely (collapse) late in the season because of the fruit load stress. Fusarium wilt collapse should not be confused, however, with sudden wilt of melon. Sudden wilt is a complex disease associated with plant stress brought on by heavy fruit set, cool evening soil temperatures followed by warm and sunny days, feeder root loss caused by soilborne fungi (may include Verticillium and other species), and virus infection (primarily cucumber mosaic and watermelon mosaic, but also papaya ring spot W strain and zucchini yellow mosaic virus). Fom survives in the soil as chlamydospores, which are thick-walled modifications of the mycelium. Fom may also be seedborne, both externally and internally. Internal infection is limited to the area immediately beneath the seed coat and does not infect the embryo. The local dissemination of the pathogen occurs primarily via movement of infested soil and plant debris. Infection of the host occurs by penetration of the root, primarily in the area of elongation, and is aided by wounds. Root-feeding larvae of the striped cucumber beetle may increase the incidence of wilt and also reduce the number of Fom propagules necessary to induce wilt. Environmental and soil conditions are important for infection and in symptom expression. Disease severity is maximum at soil temperatures of 64-77°F and declines dramatically above 86°F. At high soil temperatures, plants become infected but may not wilt; rather they develop severe stunting. As with most Fusarium wilts, the following apply: 1) low soil moisture favors the pathogen and accentuates the wilting symptom; 2) high nitrogen, especially NH4-nitrogen, and light, sandy, slightly acidic soils (pH 5-5.5) favor disease development; and 3) liming the soil to increase the pH to 6.5-7.0 decreases wilt severity. Generalizing is difficult, however, because Fusarium wilt is a problem over such a range of environmental and soil conditions in the United States. Populations as high as 3,300 propagules/gram of soil have been reported in wilt-infested soil but decline more than fourteen-fold during a nine-month fallow interval between crops. Wilt-susceptible varieties tend to increase populations of the fungus. Unfortunately, Fom is saprophytically competitive with nonpathogenic strains of F. oxysporum and can survive on such nonhosts as tomato, alfalfa, etc. A statewide survey was initiated in 1993 to determine the current race distribution in New York. Plant samples were collected from seven counties (showing classical Fusarium wilt symptoms) or were submitted by Cornell Cooperative Extension agents (mainly showing sudden wilt symptoms). Race 1 was confirmed from three fields in Washington County, with one location near the site where race 1infected plants were first discovered in 1992. Race 2 was recovered from another farm in Washington County and from an additional farm in Niagara County. Also collected were 390 soil samples from farms in the seven counties that produced melons in 1992 and were growing melons in 1993, to establish the soil survivability of races 1 and 2 by region. Race 1 was recovered from soil samples collected in Erie, Niagara, Onondaga, Schoharie, Columbia, and Washington counties. Race 2 was recovered from soil samples collected in Erie, Schoharie, Rensselaer, Columbia, and Washington counties. Based on the soil sampling results, we can conclude that both races are more widely distributed in the state than was previously thought. Crop rotation is generally not totally effective because chlamydospores survive so long in the soil and the pathogen can survive in or on the roots of symptomless carrier plants. Soil fumigation with a broad-spectrum biocide provides good initial control, but recolonization of the soil occurs very quickly. Liming the soil to pH 6.0-7.0, as well as reducing nitrogen levels in the soil, significantly reduces wilt. The most effective and practical means of controlling Fusarium wilt of melon is through the use of resistant varieties. Work to develop resistant varieties began as soon as the disease was described, and now resistance genes conferring resistance to races 0, 1, and 2 have been incorporated into U.S. commercial varieties and hybrids. One such hybrid that performs well in New York is the variety Athena. 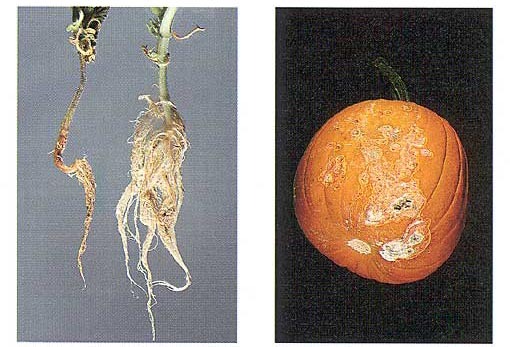 Fusarium crown and foot rot of squash and pumpkin is caused by Fusarium solani f. sp. cucurbitae. The pathogen exhibits host specificity for all cucurbits. Figure 4 illustrates the experimental seedling response of (left to right, top) Saticoy melon, Marketmore 76 cucumber, Waltham butternut squash, and Burgess buttercup squash; (left to right, bottom) Howden, Baby Pam, and Spirit pumpkins. The organism is also thought to exist as races. Fusarium crown and foot rot of squash was first described from South Africa in 1932. In 1939, widespread reports were received from New York, Connecticut, and Massachusetts regarding a serious disease of summer squash which was subsequently traced to a particular lot of seed grown in Oregon. The disease has also been reported in Australia and Canada. While its distribution in the United States is limited, it still remains a concern for cucurbit growers. The crown and foot rot phase of disease has occurred sporadically in New York since 1939, but in 1995 the fruit rot phase was experienced in two widely separated counties. The first symptom usually noticed in the field is wilting of the leaves. Within several days, the entire plant may wilt and die. If the soil is removed from around the base of the plant, a very distinct necrotic rot of the crown and up per portion of the taproot is evident (fig. 5). The rot develops first as a light-colored, water-soaked area which becomes progressively darker. It begins in the cortex of the root, causes cortex tissue to slough off, and eventually destroys all of the tissue except the fibrous vascular strands. Infected plants break off easily about 2-4 cm below the soil line. The fungus generally is limited to the crown area of the plant. The main and lower portions of the taproot are not affected, except under extremely wet conditions. Likewise, the stem is not affected, except for the lower 2-4 cm immediately above the soil line, as seen in experimentally inoculated Howden pumpkin seedlings (fig. 6). Plants showing symptoms develop numerous sporodochia and macroconidia (spores) giving the mycelia a white to pink color on the stem near the ground surface (fig. 5). Fruits are attacked at the fruit-soil interface; the severity of the fruit rot depends on soil moisture and the stage of rind maturity at the time of infection (fig. 7). Fusarium crown and foot rot is caused by F. solani f. sp. cucurbitae. Two races have been described. Race 1 causes a root, stem, and fruit rot. It occurs worldwide and is responsible for the disease in New York. Race 2 causes only a fruit rot and has been reported only in California and Ohio. Recent work, however, has separated these two races into different mating populations which most probably means that the two races represent different species. F. solani f. sp. cucurbitae forms all three asexual spore types (microconidia, macroconidia, and chlamydospores) typical of Fusarium and they are the means of survival (overwintering). Both races can be internally or externally seedborne. But F. solani f. sp. cucurbitae apparently survives for only one to two years in seed. Infection does not appear to affect seed viability or germination. Although the fungus produces abundant chlamydospores, it apparently survives for only two to three years in soil, which is much less than F. oxysporum or even other formae speciales of F. solani. Plants and fruit of any age can be infected. Laboratory studies have shown that most cucurbits are susceptible when inoculated in the seedling stage (fig. 4). Mature cucumbers, however, are much less susceptible than other cucurbits. In the field, the disease is generally a problem only in summer squash and pumpkin. In the two instances where pumpkin fruit infections occurred in 1995, larger pumpkins like Howden were more susceptible than Happy Jack and Sweet Sugar, and Baby Boo was essentially unaffected. The summer of 1995 was unusually hot and dry, and both growers resorted to drip irrigation to reduce drought conditions, thus providing ideal soil moisture for infection to occur. Under controlled inoculations in 1996 of the varieties Howden, Spirit, and Baby Pam, the smaller pumpkin Baby Pam was as susceptible as the larger pumpkins. An explanation for this difference may be that the smaller varieties matured sooner in the field, and the time of infection and environmental conditions may not have been conducive for fruit infection to occur. Fusarium crown and foot rot occurs sporadically in most areas, and disease severity depends on soil moisture and inoculum density. In the two cases where fruit rot occurred in New York in 1995, needed moisture was added by trickle irrigation, which is not a normal grower practice. This undoubtedly provided more constant moisture for the fungus to develop on the rind in contact with the soil. Because the fungus survives in the soil for only two to three years, a four-year rotation is usually adequate for disease control. Planting fungicide-treated seed also reduces disease initiated from infected seed. Fruit rots caused by various Fusarium spp. are some of the most common pre- and postharvest diseases of cucurbit fruits. Fusarium rots have been reported on cucumber, melon, honeydew, watermelon, squash, and pumpkin. Of immediate interest to New York growers are the reports of fruit infection of melon by Fusarium oxysporum f. sp. melonis (fig. 8), infection of pumpkin by F. solani f. sp. cucurbitae (fig. 7), both discussed earlier; infection of pumpkin by various species (F. acuminatum, F. graminearum, F. eduiseti, and F. avenaceum in Arkansas and Connecticut); and infection of butternut squash by Fusarium sp. (fig. 9). In the case of Fusarium oxysporum f. sp. melonis infection of melon, Fusarium rarely directly penetrates the epidermis; rather, it invades the fruit through the stem end. As postharvest breakdown proceeds, other secondary fungi like the dark mycelial growth of Alternaria rot (Alternaria alternata) may also be found (fig. 8). Wounding also does not seem to play a role in the infection of pumpkin by F. solani f. sp. cucurbitae and other Fusarium species. We have not observed Fusarium infection of immature or mature butternut fruit in the field, but have found it in the stored product after injury or invasion by the black rot fungus (Didymella bryoniae) (fig. 9). Figure 8. Fruit rot caused by Fusarium oxysporum f. sp. melonis Figure 9. Butternut rot caused by a Fusarium spp. Control of Fusarium fruit rots of melon caused by Fusarium oxysporum f. sp. melonis and of pumpkin caused by F. solani f. sp. cucurbitae involves reducing the chance for infection by following the cultural practices mentioned earlier. Field-culling of unmarketable fruit can reduce the risk of additional spread of inoculum during postharvest operations. Avoiding wounds during harvest, curing properly, and controlling temperature and humidity during longterm storage will reduce most postharvest decays. Refer to Fact Sheet 732.10, "Fruit Rots of Squash and Pumpkin," for specific storage recommendations.